German insurance giant, Allianz, has renewed its Formula One sponsorship, which began in 2007. As in past years, Allianz will utilize Formula One to highlight the importance of risk management and road safety. Allianz will continue to utilize Formula One to communicate the topics of risk management and road safety. 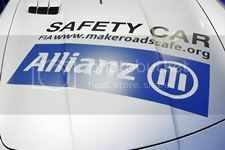 Allianz will be prominently branded on the Safety Car and the Medical Car used at all Grand Prix races. In addition, Allianz plans numerous safety events in various locations around the world with AT&T Williams drivers, the Official Formula One™ Safety Car driver Bernd Mayländer and ex Formula One™ driver Allianz Safety Ambassador Christian Danner. Allianz will also continue to provide journalists and media worldwide with graphics, pictures and videos free of charge. "Performance capacity, teamwork, innovation, dynamism, the constant balancing of risks and the greatest possible safety are decisive for success – not only in the top class of motor racing. These factors, combined with confidence and reliability, are our standards for customer service anywhere in the world," said Allianz CEO Michael Diekmann. Allianz first entered into Formula One in 2000 by partnering with the Williams F1 team. In 2002, trackside advertising was initiated to drive brand awareness worldwide, primarily targeting Europe and Asia. In 2007 Allianz became an "Official Global Partner of Formula One," providing exclusivity in the Financial Services sector.